Very Early Girl is our first very early outdoor Sativa designed especially for shorter summers in Canada with the same great sativa buzz. Very Early Girl can grow low to the ground in cool climates like Quebec or as high as pine tree in southern California. Very Early Girl has been providing Northern Canadian growers Sativa Genetics with massive THC trichome-frosted buds for our unique northern climates in as far north as Quebec. 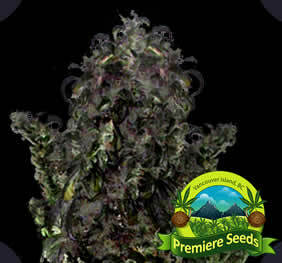 Mold resistant and vigorous bushy low growth, Very Early Girl can provide pounds of buds without the height of the sativa for concealed outdoor growing. Or 10 Pounds plus per plant in hot climates. Very Early Girl truly is a remarkable buzz for morning hits to get you outta bed. Very Early Girl can be started indoors at the end of winter (March in Canada) and can be easily transferred outdoors to a location with maximum exposure to direct sunlight a few weeks later end of April. Be sure to allow wide spacing between plants, especially if growing directly in direct sunlight, as these ladies can attain a final height equivalent to a small tree. If you want steath growing outdoors, plant in shady area’s and don’t grow these ladies in rows, plant them in a zig-zag manner to conceal from airplane view. This plant really blends into it’s surroundings and can be hard to find during harvest if you don’t mark the exact spot where you planted it. Early is a great plant to use stop thieves from stealing these babies from your grow area as they blend in well to its surroundings. GROWS:: Outdoors, can be grown indoors, but why? thanks for this early harvesting strain, i love to beat the helicopter raids by having them harvested fully flowered weeks before.